This month, a series of White Horse Inn Discussion Groups will be held across the west side and Uptown. They are for any Christian that would like to think more deeply about the faith. Please, join us. If you have a Facebook account, simply go to the event page and click “join”. If you don’t have an account, send us an email so we know you’re coming. Looking for a carol service in Cincinnati? What follows is an interview with Pastor Danny Hyde of Oceanside United Reformed Church about his recent address to the annual NAPARC meeting, which encouraged them to pursue Reformed ecumenicity. Pastor Hyde blogs at Meet the Puritans and is the author of numerous books on Reformed theology, such as Welcome to a Reformed Church. 1. Thanks so much for your willingness to answer a few questions, Pastor Hyde. First, could you tell us a little bit about yourself and how you became a Reformed minister? Thank you for the opportunity, Zac. I am a born and bred native of SoCal. After being baptized in the Roman Church out of custom and superstition, my father was converted at Calvary Chapel Costa Mesa. I spent some time there as a young child in Sunday school, as well as in Mass during holidays with family. After the brokenness of my family finally came to a climax, I was finally converted in a Foursquare Church before heading off to college to play basketball. It was there that I became disillusioned with my Charismatic and Pentecostal experience. I went on a spiritual journey, investigating every major world religion before God found me at the right time, at the right place with the purity of the gospel in the Reformed confession. I went off to Westminster Seminary California with the goal of planting a Reformed church in an area of SoCal that had no Reformed church. 2. You obviously have a lot of responsibilities within your congregation, so why did you consider it important to attend the NAPARC meeting in Chicago? I am thankful that I am given time off from my labors here at OURC to speak to a wider audience. When I was asked to be the annual speaker at NAPARC I was humbled that I of all people would be asked to do that. As a total outsider to the alphabet soup known as the conservative Presbyterian and Reformed world, I have my own particular vantage point on the problems that plague us. And I pray that I also have a unique perspective on the way forward. So, it was important because I believe that in our unity we find our strength to be salt and light in our culture that I agreed. 3. From an historical standpoint, why are there are so many different Reformed and Presbyterian denominations in America (I count twelve in NAPARC)? Also, what keeps them apart? The different denominations find their roots in distinct reformations in the sixteenth and seventeenth centuries. For example, the United Reformed Churches (URC) and Free Reformed Churches (FRC) are rooted in the Netherlands reformation. There are historical reasons why the mother churches of these denominations in the Netherlands were distinct, which led to their distinctness when they arrives in North America. Because these churches originally spoke Dutch, and were from the European continent, this meant there would be differences with Presbyterians in England and Scotland who spoke English. So when these people came to the New World and later United States, their circumstantial and well as doctrinal differences became distinct denominations. 4. What was your message to the NAPARC delegates? My message was a follow-up to Dr. W. Robert Godfrey’s address last year, A Reformed Dream. It was entitled, “From Reformed Dream to Reformed Reality: The Problem and Possibility of Reformed Church Unity“. In a word, the problem of unity is our sin, but the possibility is the power of the Holy Spirit. But aren’t there more covenants in the Bible than just the old and new? Of course. These two are unique, though, because God articulated them within an official collection of documents. Similar to the way in which the American Constitution provides the legal foundation for our society, the Old Testament gave the Israelite nation its standing as an official nation. Surely, this collection told the Israelites about other covenants with Adam, with Noah & creation, with Abraham, and the future new covenant, but the collection in and of itself is attached to Mount Sinai and has become obsolete insofar as it constitutes God’s People (Heb. 8:13). Presently, it is the New Covenant collection that constitutes the People of God. It must never be separated from the Old Covenant, though. The Old serves as its authoritative prologue, giving us the necessary context for understanding the New. 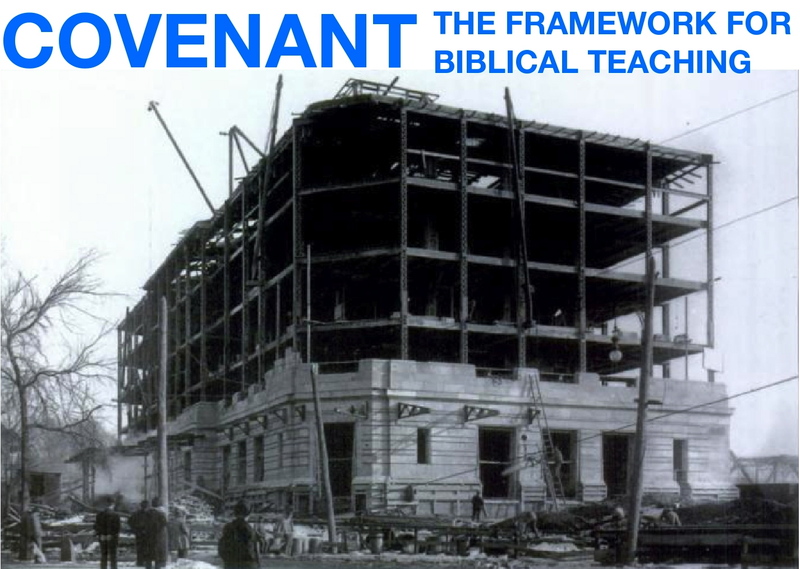 While we are no longer required to keep the civil and ceremonial aspects of Old Covenant law, we do learn a great deal about God, His moral law, His Messiah, the salvation He grants His Church, and the praise that is due His name. 1. Richard A. Muller, Dictionary of Latin and Greek Theological Terms (Grand Rapids, Mich.: Baker, 1985), 297. 2. The labels of Old and New Testament/Covenant are not inspired but are interpretations of the Bible’s content. Given the ancient pedigree of this interpretation, we must give it great respect and consideration. Question 7: From where, then, does this depraved nature of man come? Answer: From the fall and disobedience of our first parents, Adam and Eve, in Paradise, whereby, our nature became so corrupt that we are all conceived and born in sin. Western individualism hates the notion that one person’s decision could have consequences for someone else. But were God to conform His ways to each culture’s preferences, contradiction and chaos would ensue. Whether we like it or not, the all-wise and infinitely good God of the universe made Adam the representative Head of mankind; reality can’t be sugar-coated. His obedience to God would procure eternal life for him and his descendants, but disobedience would bring spiritual death (“one trespass brought condemnation for all men” Rom. 5:18a). Though God gave him every chance of success by equipping him with moral uprightness, he submitted himself to the word of the serpent instead. As a result of his guilt, he and his descendants were cast out of His Kingdom. Spiritual death ensued, making us, by nature, morally twisted and destined for judgment (“by the disobedience of the one man, the many were made sinners” Rom. 5:19a). In other words, at the root of all the evil in the world is the failure of our forefather, not some “mistake” in God’s design of us. So What’s This Reformed Stuff About? Is the Bible a mere library, a collection of books written by different authors on diverse topics? Or does it have an inherent unity? And if so, how do you relate its apparently disparate parts? For Adam and Eve, a single sin brought banishment from God’s presence; yet, the worst of all sinners found fellowship with Christ. Wickedness in the world brought the great Flood, whereas the subsequent heights of mankind’s sin have provoked no such judgment. How do we account for the diversity of the experiences of God’s people at the time of Abraham (pilgrimage), under the Law of Moses (theocracy), and post-Christ (pilgrimage)? What gives?! The ancient names given to the two parts of the Christian Bible give us the answer; the concept of “testament” (Latin: testamentum), or its synonym “covenant”, brings unity to the Bible’s diversity, harmony to its differing notes. Keep up with this series (and invite others to do so, too) as we consider God’s covenants and why they give us the framework for understanding the Bible’s unfolding story of salvation.